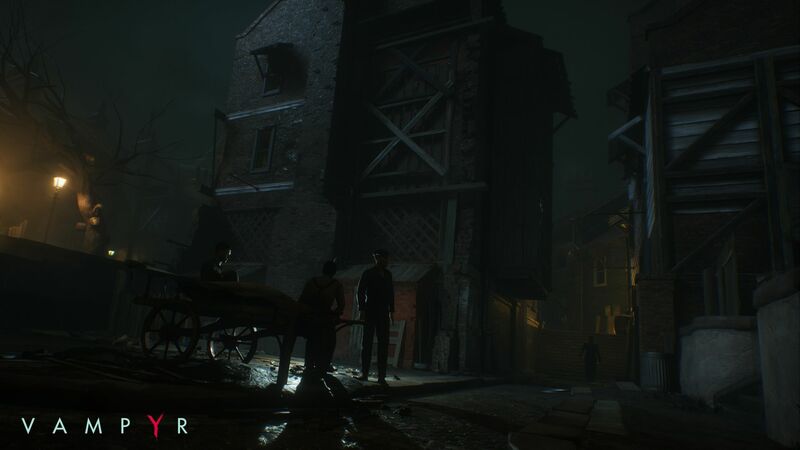 Vampyr is set in London in 1918. It is the tail end of World War I and the Spanish Flu epidemic is tearing across the city once again. Fresh from the trenches, Dr. Jonathan Reid is a newly created vampire on a quest for knowledge about his new undead condition and the epidemic that plagues the city. Along the way, Dr. Reid will meet the citizens on London and learn their stories as he copes with his thirst for blood. Players will get the opportunity to decide who lives and who dies, but every death will come at a cost for the community. While some may describe Vampyr as an action RPG, I think the game is better described as part adventure game and part action-RPG. 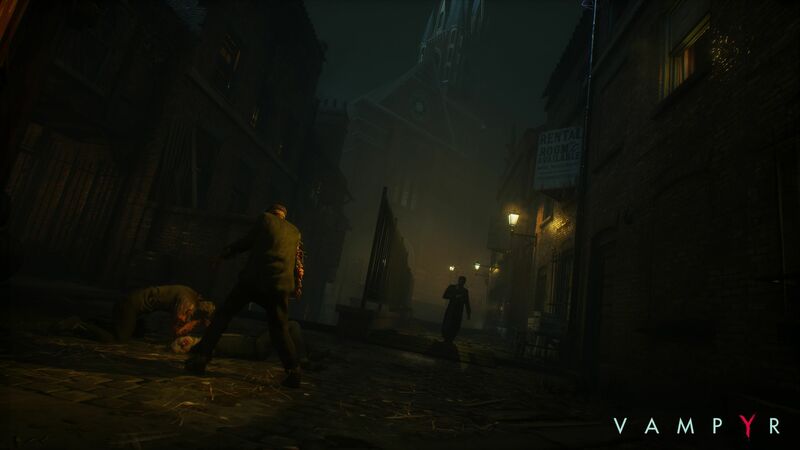 Vampyr’s mix of gameplay mechanics is similar to how L.A. Noir mixed adventure-style investigation segments with an open world shooter. As such, Vampyr’s writing is thrust front and centre for the gamer to experience. Every friendly NPC in the game’s four districts have personalities, back stories, and secrets that Dr. Reid will tease out as he speaks with them. Players are incentivized to learn about characters, even if the player plans on murdering them all for experience points, as revealing NPC secrets will yield more experience points in the end. The writing in Vampyr is excellent. The world is meticulously crafted. The writers create a complex view of London, capturing things like the despair of a war-weary nation wracked by the Spanish Flu, the challenges of being a refugee in 1918, and the excitement of scientists in a world on the cusp of some of the great advancements. The multifaceted version of London serves as an excellent way to ground the supernatural elements of the story, as the writers fill the city with secret societies and mythical beasts. Vampyr’s cast of characters is one of the game’s strengths. The characters run the gamut, giving thirsty players options if they feel like becoming the fangs of justice. At the same time, I find players trying to kill or spare every NPC they meet will feel emotionally challenged, as there are characters that are easy to love and hate. Characters have deep ties with each other. Digging up their secrets will often require speaking to their neighbours or finding the odd letter scattered around the neighbourhood. These relationships breathe life into Vampyr’s take on 1918 London. The game’s plot is intriguing, though it can fall to the wayside at times with the total information overload that comes with so many characters in a game. The writers have taken classic vampire lore and given it their own twist, mixing in new vampiric lore ideas with actual history. Dr. Reid can sound like a bit of a broken record at times with his repeated introductions as a doctor and a World War I veteran, but some depth comes out slowly and surely as the story progresses. Vampyr’s combat is a slower paced affair, more along the lines of Dark Souls than the Batman Arkham series. Dr. Reid is able to use close ranged weapons, firearms, and a variety of vampiric abilities. Attacks and dodging is always limited by stamina and blood pool. Players are given a large number of options to build their characters, from a blood hungry mage to a close up brawler. In early game, I found dodging to be necessary. As the game progressed, different builds allowed for alternative methods of negating or soaking damage. In the end, I found the combat to be rather dull and repetitive. Each enemy type has two or three attack patterns. Bosses generally are harder hitting versions of basic enemies. As such, combat just boils down to kiting enemies around and getting in the odd hit until they die. Vampyr’s mystery adventure mechanics work well. Players are incentivized to learn and care about London’s citizens. Each citizen has a base amount of experience but learning their secrets and doling out medicine to ensure they are healthy increases the potential amount of experience that can be culled from killing them later. 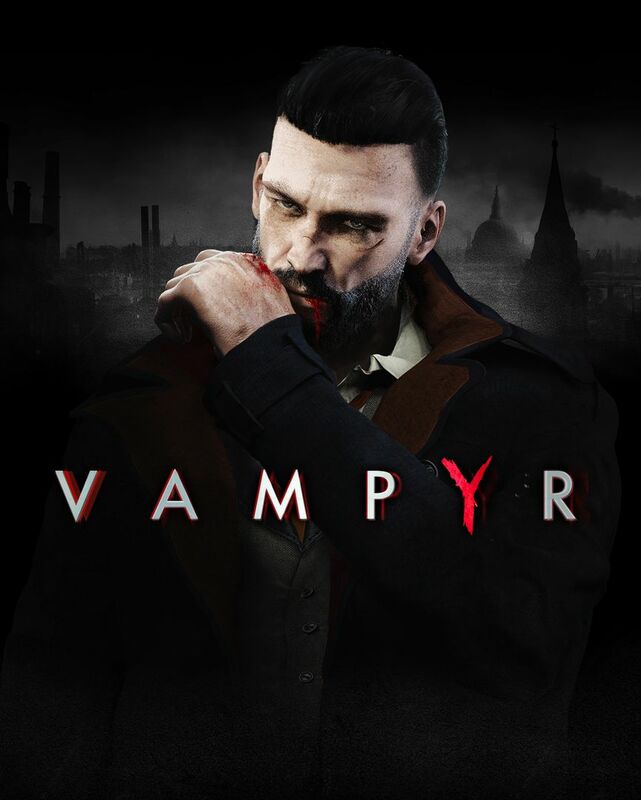 Vampyr is billed as a challenging game that constantly forces players to decide whether killing a story NPC for their blood is worth the power boost. Frankly, I did not find the game hard enough that I ever felt the urge to feed for a quick boost of experience. Once a player learns the basic enemy attack patterns, it is quite easy to tackle enemies several levels above the player. Vampyr’s controls are decent. The controller and mouse and keyboard are on par in my testing. The menus are laid out well for the most part, though I would prefer some better information in the menus on where story characters can be generally found. While the vampiric sense has a long range, it’s hard to memorize the location of the fifteen or so characters that inhabit each district. Combat controls are solid for the most part, though I find the camera can sometimes get stuck at bad angles unless the player uses the lock on feature. 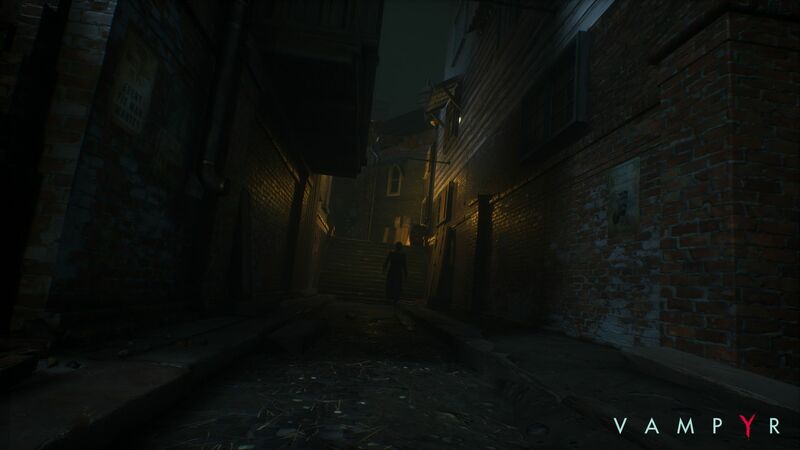 The PC port of Vampyr is decent but could use some improvements. The game comes loaded with plenty of visual options to adjust but is locked at 62 FPS. Some tinkering with config files can unlock the frame rate, but it would have been better have that option in-game. I also found some areas had severe frame rate drop in my testing. I ran at or near the 62 FPS cap most of the time, but some areas could easily trigger a 25-30 FPS drop. 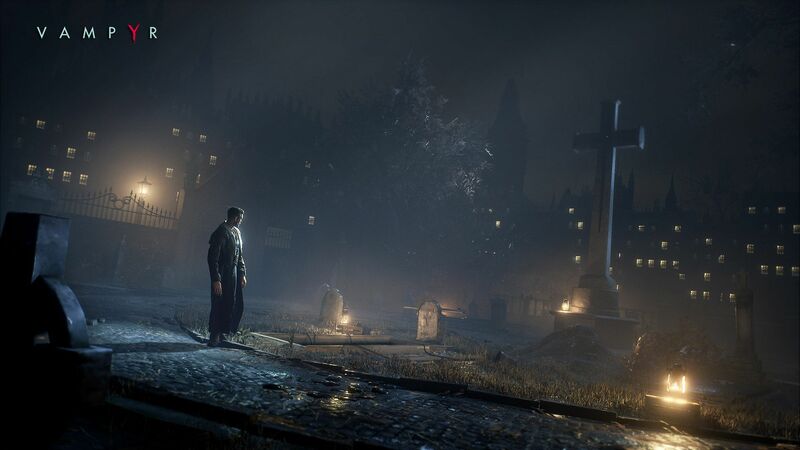 Vampyr is an excellent looking game. 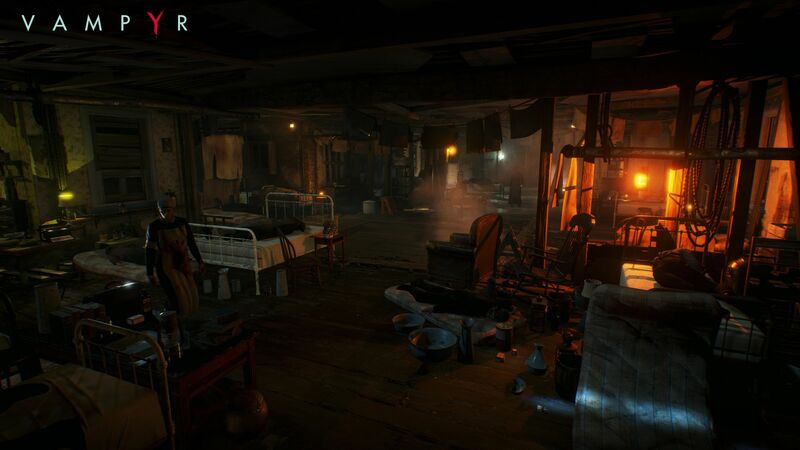 While I’m not sure if Dr. Reid’s modern fades is era accurate, the developers generally do an excellent job of bringing 1918 London to life. The game’s dark, gritty look interspersed with crimson blood fits perfectly with its vampire theme. Vampyr delivers a solid audio experience. The sound effects are good, although some of the animal sounds feel a little canned. The music is dark and subtle, which makes for a perfect accompaniment to Dr. Reid’s late-night wanderings. While all of London’s accents sounds the same to my Canadian ears, the voice acting in general is excellent. The quality stays high even though every character’s lines are fully voice acted. Vampyr is a solid adventure game with a decent action-RPG attached to it. The audio-visual experience is extremely polished. The story is enjoyable, and I found myself growing attached to my in-game neighbours. Combat is a bit dull and feels too easy once a general pattern of dodges, stuns, and heals are established. If you can look past the combat, Vampyr is absolutely worth a try. Vampyr delivers an excellent story experience, but is held back by its dull and repetitive combat.